Technology can be fun. Think of the many hours you spend doing something you enjoy on your phone or tablet. But technology can also be a powerful tool to wield. You don't have to look any further than a new application that can actually save a life, written for Google Glass by a Doctor The app, devised by Christian Assad, MD, comes into play once someone wearing the connected specs witnesses someone passing out. Let's say you are the person wearing Glass and you see someone pass out. Saying "OK GLASS, CPRGLASS" sets things into motion. You are instructed to check ABC (Assess Airway Breathing and Circulation). If no pulse can be detected, you say "OK GLASS, No Pulse!" If you do not know how to find a pulse, Dr. Assad adds that a way to detect a pulse using a regular camera has proven to be quite accurate and that this is being written into the program. 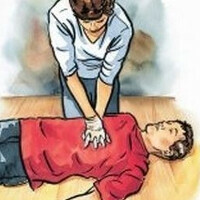 If there is no pulse, you are guided to do CPR, ironically by following the BeeGees song Staying Alive, which guides you through compressions at a rate of 100/min. A gyroscope makes sure that you are doing the compressions correctly. The program counts the number of compressions and the tine since you started them. 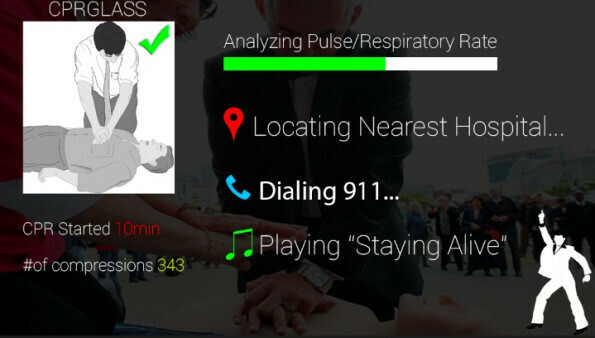 Using GPS, the program calls 911 with your location and a text message is sent to the nearest hospital with the nearest data about your CPR activity. Even saving one life makes writing this app worth it. It also shows you a side of technology that gets overshadowed by other unimportant things. Yes, you can post on Instagram a picture of your lunch, but you can also save a life. You know this can be done on a smartphone as well. Since this coded specifically for Google Glass, no, you cannot do this on a smartphone. If this article was about the same thing on an iWatch you wouldn't have made a peep. Shut up sometimes and accept cool things for what they are. Yes he would have peeped. He'd have crowed about the innovation and claimed that Android would have copied it in its next version. Staying alive is just a common way to maintain rhythm during compressions. Some people suggest other songs... But in the moment you don't always remember. This is a great tool, but I can only imagine how effective it would be in the hands (or face?) of someone who is already CPR certified. Dr. Assad should also add instruction to check apical pulse, easier than the carotid. it is? TIL something interesting.. The program should also include a reminder to send someone for an AED. For reasons like this, Google Glass is going to be true game changer. Check ABC??? That app is gonna need to be updated because now it's CAB instead. There's a greater emphasis on compressions in the updated CPR guidelines. Nice to see worthy used for common tech being developed. The real question is... can you instagram yourself while saving a life! ?